If you plan to make a trip to Yellowstone National Park and want to within your travel budget, it's important to make your plans in light of the costs and conditions. To make a budget that's realistic, take a look at some major categories to consider if you're planning to visit this national treasure in northwestern Wyoming. As of May 2018, the entrance fee is $30 for a private, noncommercial vehicle; $25 for each snowmobile or motorcycle; or $15 for each visitor 16 and older entering by foot, bike, ski, or any other method. An annual pass is $60 Note that operating hours vary by season. If you're flying and then renting a car, you can choose from several airports that are relatively convenient to Yellowstone. Cody and Jackson Hole, Wyoming, are the closest, at 78 and 101 miles away, respectively. Bozeman, Montana, is 132 miles away; Idaho Falls, Idaho, is 164 miles from the park; and Billings, Montana, is 184 miles away. Salt Lake City is the biggest city and airport that is in the area, but at 376 miles away, it makes for a very long drive to Yellowstone. Check out budget airlines for good fares. Allegiant flies into Billings; Horizon serves Idaho Falls, Billings, and Salt Lake City; Frontier lands at Billings, Bozeman, and Jackson Hole; and Southwest serves Salt Lake City. 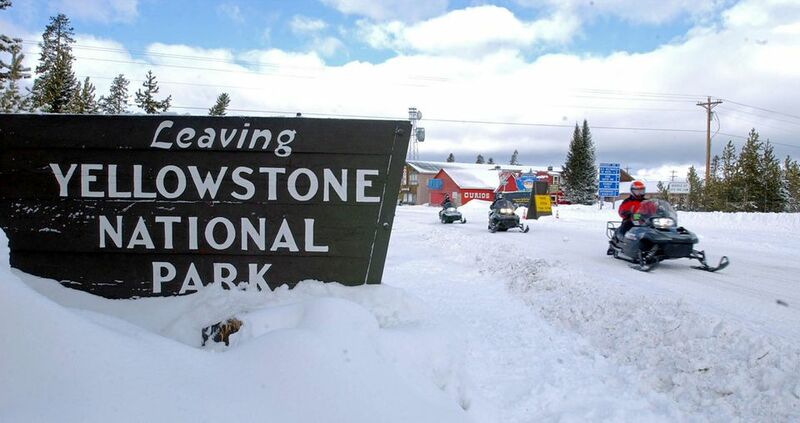 Many people who visit Yellowstone stay in one of the park lodges or make use of camping facilities. Conventional hotel rooms are distant and often hard-to-book during the busiest seasons. You will find lodging options just outside the park to be few in number. West Yellowstone offers a few options, as does Cody. Regardless of where you decide to stay, you should book well in advance since Yellowstone is extremely crowded during the summer, and lodging is in high demand. There are nine lodges and 12 campgrounds in the park. As with many popular national parks, the lodging available here fills up quickly in the summer. Many visitors make reservations a minimum of six to eight months in advance. The most popular of these lodgings is the ​Old Faithful Inn, offering more than 300 rooms, but this is not a budget alternative. You might want to splurge for a night or two at this iconic lodge that is a destination in itself. Backcountry camping is allowed, but you must pick up a permit in person no more than 48 hours before your visit. Limits are imposed on the number of permits issued each day. Camping in Yellowstone is possible at 12 campgrounds, where you can make reservations in the morning for your stay. But in peak season, these spaces often fill up early in the day, so start early. Note that each campground has its own annual schedule, with only Mammoth open all year. Old Faithful is probably the world's most famous geyser, and it attracts constant attention, with eruptions every 60 to 90 minutes. However, the world's largest concentration of geysers is found in this area, and you can explore many others. Another breathtaking sight here is Yellowstone Canyon, the namesake of the entire park. Don't miss the view of the Lower Falls and the canyon; it's something to savor. Yellowstone is a large park, and distances between points of interest can be great. There are bus tours you can take within the park. Note that many roads here are closed during the winter months. Make note of road schedules and construction areas when you plan your trip so you won't be caught in the wrong place at the wrong time. Many people combine a visit to Yellowstone with Grand Teton National Park, about 100 miles to the south in western Wyoming.